Pramod Kimothi did B Sc (Zoology, Botany, Geology) and later did Masters in Botany. Post that, he worked as a JRF (Mistletoe) at DBS College. 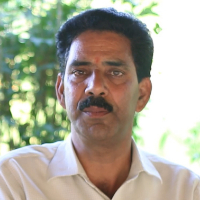 He has also worked with various NGOs before joining Navdanya Biodiversity Farm. He is Farm Incharge there. Organic Farming relies on fertilizers of organic origin such as compost manure, green manure, and bone meal and places emphasis on techniques such as crop rotation and companion planting. Biological pest control, mixed cropping and the fostering of insect predators are encouraged. "After completing my B Sc (Zoology, Botany, Geology) and Masters in Botany from PG College, Gopeshwar, I worked as a JRF (Mistletoe) at DBS College. I have also worked with various NGOs before joining Navdanya Biodiversity Farm. I am Farm Incharge there."